The use of new technologies in the fruit and vegetable sector is helping improve and facilitate decision making. 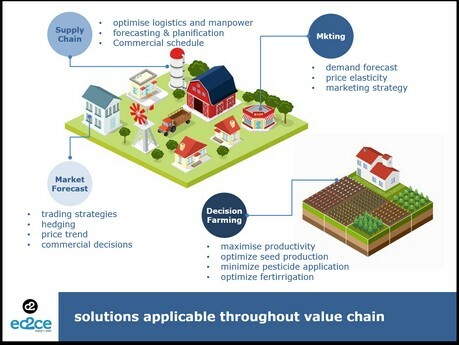 In particular, the Spanish company ec2ce has focused on two important aspects of the supply chain: the optimization of productivity in greenhouses, using prediction algorithms based on data such as irrigation, agricultural management, climatology, etc. ; and the management of commercial strategies for marketers, based on predictions about available stocks after one, two and three weeks (using historical data), calibres, prices, and weather forecasts (which determine the available production). In both cases, ec2ce develops the projects in three stages. In the beginning, work is done together with the client to collect all the necessary data and test the model; this is followed by a live stage taking place during part or a whole campaign, during which it is checked whether the real situation matches the prediction. Once this stage is over, it is time for the commercial exploitation to begin. "It is a process in which we demonstrate how well the predictive model works, adapting perfectly to the needs of the client. It becomes very profitable very quickly," explains Jesús López, head of business development at ec2ce. At the moment, ec2ce already offers its service to various clients in Spain, especially in the area of Murcia and Almeria as far as the horticultural sector is concerned, and also in Huelva, with its red fruits. It also has projects in Argentina and the US, "where we are establishing ourselves as the next step in our growth," adds López.